In a marine tank the bed plays a different role, as the sparse vegetation found in this type of aquarium does not take root in the bed, and so the sediment does not need to be very dense and can be made up of coarser granules. 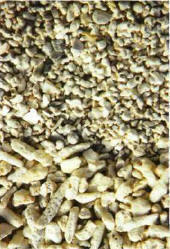 Two types of sediment are most common in marine tanks: maerl (above) and eroded and crushed coral, which is coarser, below. Two materials are used mainly, but they are often confused and grouped together under the term "coralline sand". This is a coarse sediment, taken from certain sea beds and consisting of calcareous algae and the remains of mollusk shells and Anthozoan skeletons. It is very rich in calcium and reduces variations in pH. The thickness of this sediment can vary, depending on the extent of the crushing. It consists entirely of pieces of the skeletons of corals and other similar animals. The fragments have been sufficiently eroded so that any injury to creatures that walk on the bed or burrow into it is unlikely. It contains practically no calcium, but it does control any variations in the tank's water pH. These two beds for marine tanks are available in the aquarium trade. This is taken from the sea and sold moist by aquatic retailers. It contains a large number of micro-organisms, such as the bacteria in the nitrogen cycle. It is therefore, in theory, ready for action as soon as the aquarium is put into operation, which is not the case with other sediments. However, the results differ greatly from one tank to another, and many hobbyists are unconvinced about the beneficial effects of this sand. There is a temptation to collect sand from the seashore, as it contains bacteria, but several precautions must be taken if you choose to do this. 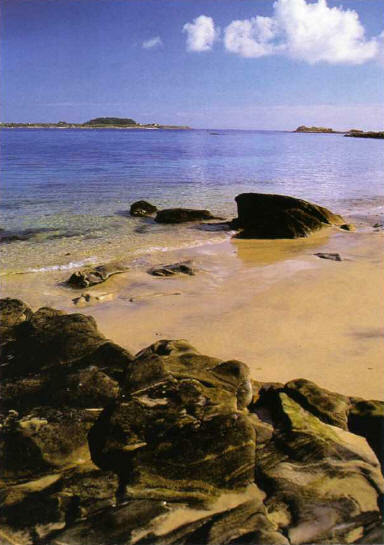 Find an area free of pollution, with plenty of movement in the sea, and collect some coarse sediment. If this only comprises sand it will be deficient in calcium, but it can be topped off with crushed oyster shells. It is best to look for a shell sediment, mainly consisting of pieces of bivalve mollusk shells. Rinse the sediment thoroughly before introducing it into the aquarium, in order to eliminate the finest grains. N.B. : dune sand is absolutely unsuited to marine tanks. These can be mixed with the above coarse sands to increase the levels of calcium. Wash them thoroughly, to get rid of any fine particles. It must be pointed out that the last two types of sediments are not to be found in the regions inhabited by tropical fish. They cannot therefore be considered as really natural, but they can be used as a substitute for coralline sands as they are more accessible - and cheaper. In principle, it is illegal to take large quantities of sand from a beach, but no aquarist has been known to encounter problems for extracting small amounts. ЭЙФЕЛЬ (Eiffel) Александр Гюстав (1832-1923) , французский инженер. Строитель мостов, виадуков, Эйфелевой башни в Париже (1889).